Buyer personas allow a rich, in depth marketing plan. They look beyond the immediate sale to creating life-long customers and/or advocates. -And while you don’t want too many personas, you don’t want too few, either. Having a strong personal portfolio can help you fill in any holes you may have in your content offerings. It can also help you create better, more targeted marketing campaigns for better results. Send out customer questionnaires, surveys, request interviews, etc. Listening to social media is an excellent addition to market research. It’s basically free market research. People on social media talk very freely about products, experiences, wants, needs, etc. Don’t leave out this important source of information. 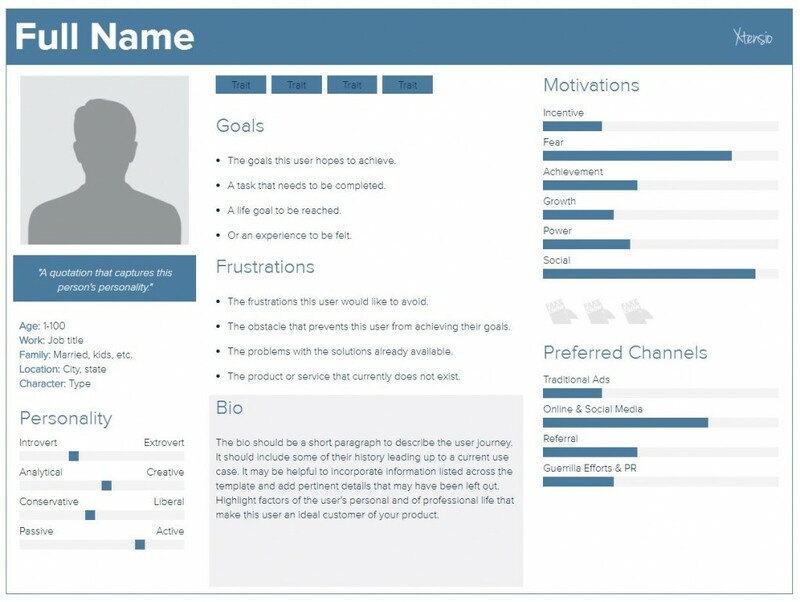 Once you have the data, you need a uniform way to create the personas. This is done with the buyer template. You can make your own or you can use one of the many templates available online. Personas, although somewhat fictional, should read as in depth as a military dossier. You’re creating a physical and psychological placeholder so you can put yourself in their shoes. With this in mind, your buyer persona template should at least include the following. Other information you might want to consider, depending on what you sell, might be: religion, education, marriage status, kids or no, etc. For example, Parent.com needs people who like kids, want kids or are about to have kids. I recently found a pretty awesome website called Xtensio that has, among other things, a persona creator. Now, DO NOT use Xtensio only. Make sure you fill these templates in with your own information. Once you get brave, start from scratch and build your own. It’s well worth it when it comes time to market to these personas. 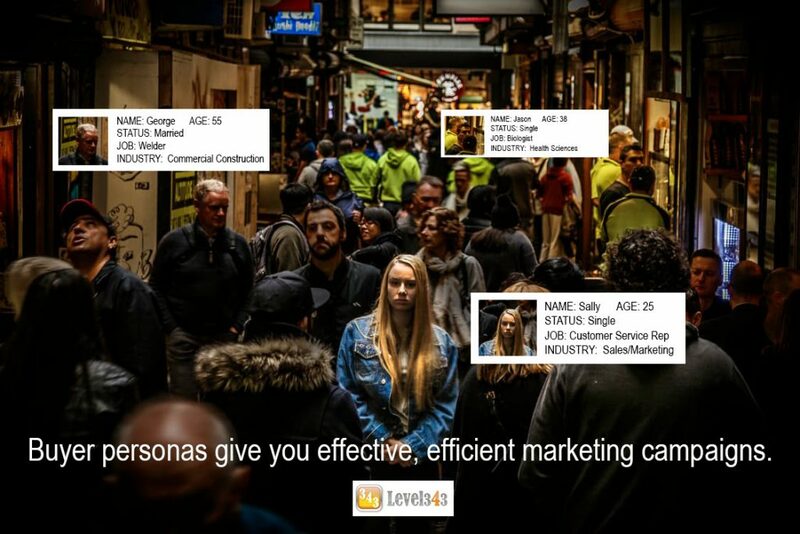 Once you’ve created your personas, it’s time to put them to use by developing marketing messages. Steve is a 45-year-old manager of a marketing company. His team works on business-to-consumer engagement, which makes him suspicious of people’s ads. He’s married, and values keeping that marriage rolling smoothly over anything else. He uses the Internet for buying research and prefers email over the phone for contact. If Steve was in your target market, what angle would you use to get through to him? What do you think would appeal to him? The answer to this is your marketing message. “XYZ Product keeps my wife smiling,” says sincere man in real life testimonial. Smiling wife nods happily. A well-rounded buyer persona allows you to step into the shoes of your customer base. It allows you to come up with the questions that need to be answered to get through to them. More importantly, it allows you to target what is most important to them. Steve might be interested in keeping his marriage strong, while the main thing unmarried Janice is interested in is advancing her career. Frank, now in his sixties, appreciates simplistic computer use, while Dawn fancies herself to be an electronic guru. Whatever their interests, you can step in, “channel” them at will, and market to them. I hope I’ve managed to impress upon you how vital buyer personas are to your business. Knowing Steve, Janice, Dawn and Frank well is the step up you need for a stronger marketing campaign, a more effective use of your marketing budget and, ultimately, higher ROI for your efforts.